As our restaurant and cafe options evolve to match our tastes, so too does our express-service dining scene. 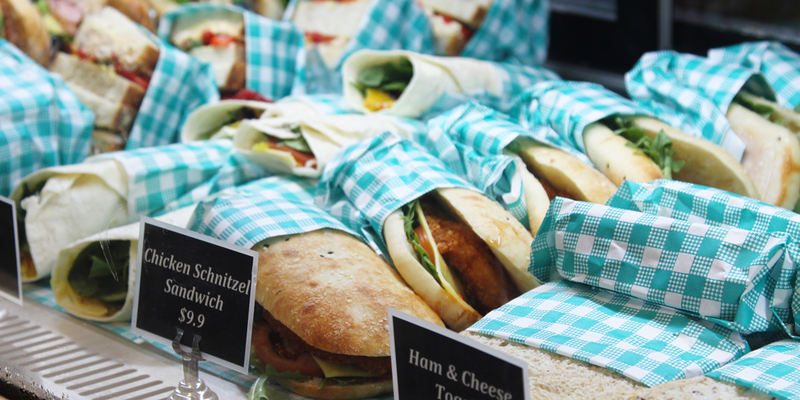 Seeing as we’re as time poor as we’ve ever been, our lunchtime tastes have gradually shifted to favour spots that can offer more without increasing wait time or distance travelled to get the goods. Harvest on Queen is a brand-new food hall that is committed to offering everything you could want for your midday meal under one roof. From grab-and-go sandwiches and coffee to salad and cheeseburgers, this marketplace is catering to those looking to meet, eat and work – with a pretty impressive view to boot. Saying that the RMS Group has had a busy couple of years would be a massive understatement. After opening up laneway bar Hellcat Maggie and relaunching Alfred & Constance in 2018, the long-running hospitality crew turned its attention towards crafting the crown jewel of its portfolio – a sizeable food hall situated in the heart of the 480 Queen building. Harvest on Queen, which opened in mid-January, is an expansive multi-faceted eatery and meeting space serving up a multitude of cuisines for the corporate crowd to devour, alongside handy amenities for the go-getters of the business set. In order to realise the vision for Harvest on Queen, RMS significantly renovated the former food court portion of 480 Queen’s dining hub. The venue’s disparate kiosks were removed and replaced by a lengthy counter featuring five distinct sections, each fed by team of culinary experts working together in an immense on-site kitchen. 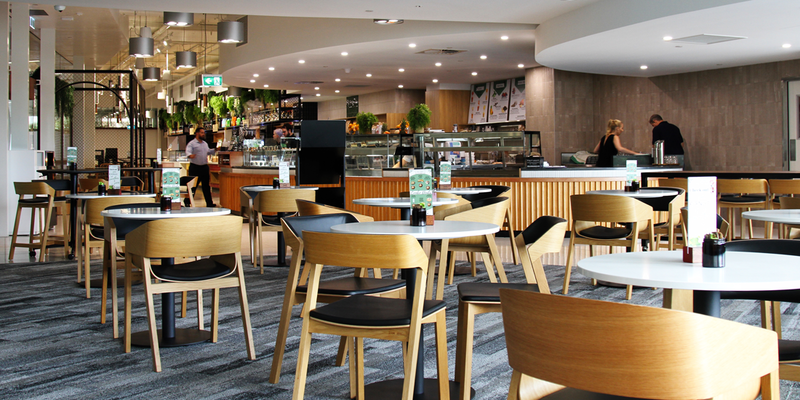 Casual seating adjacent to the counter is complemented by a striking business lounge, which offers table and booth seating (complete with views of Queen Street and the Story Bridge) and a fully equipped 18-seater boardroom, which is screened off for special lunches and meetings. Harvest on Queen also features interchangeable pop-up nooks that will be given over to rotating vendors and food displays, each hawking wares much like a bustling marketplace. Finally, a European-inspired wine and charuterie bar named The Pouring Room will open at the Adelaide Street-end of the venue come February, boasting a fridge for cured meats, a bakery wall for breads, plenty of beer taps, and room for interior and exterior dining. 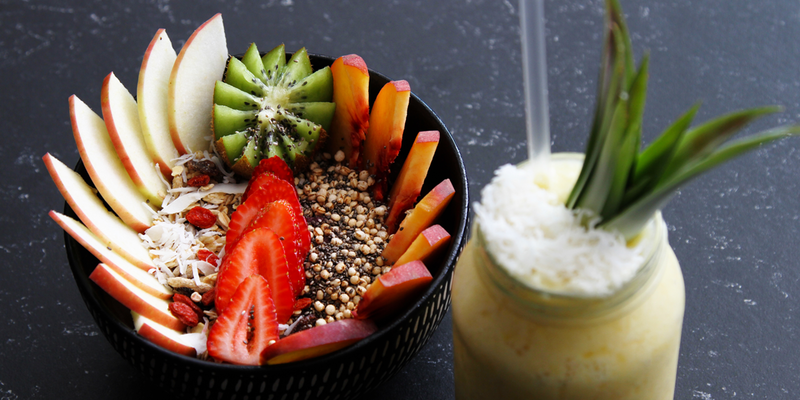 In order to cater for a plethora of tastes, Harvest on Queen has recruited a wealth of culinary talent. The kitchen employs numerous chefs (including a full-time patisserie chef and a sushi chef) to whip up Harvest on Queen’s entire offering on site. The main counter offers a grilled selection (schnitzels, roast meats and vegetables), a daily rotation of Asian wok meals, healthy salads, hot-plate meals (casseroles, pasta and quiches) and healthy eats (bagels, toasties, wraps), while pastries, vegan treats and sushi can be found just beyond the smoothie and coffee counter. Speaking of coffee, Harvest on Queen serves up two blends from Humanity Coffee Co. – the robust Medusa blend and its organic sibling Gaia. An a la carte menu can be enjoyed in the business lounge during breakfast and lunch, boasting the likes of acai bowls, chorizo omelettes, cheeseburgers, chicken parmigiana and calamari. Finally, Harvest on Queen also stocks a selection of retail products, including Hive & Harvest‘s honey and jams, oils and chutneys from Random Harvest. Harvest on Queen is open now. Get all the information you need in the Stumble Guide.